This is shravan's 150th post in obnoxious mind.i did not celebrate my 10th post, not my 50th or not my 100th post. i did not celebrate my 100 days in blogsphere, but now, i am glad that i did 150 posts, and i hope that the count goes up.. and why this post. its time now, its time now to show and express my gratitude for all fellow bloggers, who helped me, who guided and and more over who supported me. Rugma, thanks for being there always, my first commenter, and a known friend.Geethu, thanks for being a silent reader and a follower, though you are not in the blogsphere..Three persons to show sincere gratitude, K P sir, Lakshmi akka and Ayesha. K P sir, you are my inspiration and the biggest support, thank you soo much for the support, the mails, and for helping me grow. Lakshmi akka, you have always made me smile with your comments, always supportive and never on odds with my posts. Ayesha, I love reading your blog, though our views are different, and thanks for being there, for the support and for the inspiration..
not to forget, Mahesh, who is now taking his time to read all what i post, and for the comments. and finally, my most admired blogger so far, Sneha, i love your blog, the way you write, and i am thankful for the blog roll. and now, Chechi(the dispassionate lover), i hope that you will be there always, Amrita, thank you soo much for the words, that my writings are addictive, you made me blush. Rakesh vanamali,our interests are not the same, but still, thank you for being there.. zenana, i remember you, thanks for making me smile at times. 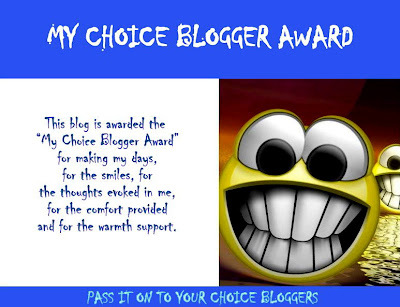 Introducing Obnoxious Mind's "My Choice Blogger Award". As the name shows, this will be awarded to those bloggers, who makes my day, who makes me think and who evokes my thoughts.. as all other awards, this one is to roll as well. 3. You may back link the person who awarded you by providing a link to the award image, though its not compulsory. Between folk, DO NOT FORGET TO VOTE, ITS YOUR RIGHT TO DECIDE, AND DECIDE THE BEST FOR US. PLEASE DO VOTE, AND LET INDIA GROW, AND NOT THE POCKETS OF THOSE POLITICAL PIMPS, THE INTERMEDIATE CLASS AND THE MANIPULATORS. The Award is ready to roll. 150 posts! Cool! Keep it going! thank you soo much, with out all your support, this wouldnt have reach up to this milestone. thank you soo much Bindhu, and i hope to see you around again. Thank you so much for the award. It is very generous of you. As you have said, our views may be different but I always believe in being myself.